Somehow it completely makes sense that I would cancel my dinner reservations at Pêche hours before it was declared the best new restaurant in the US. It’s just how I like to live. At least I did manage to score a walk-in table at lunch just before my afternoon flight back home. 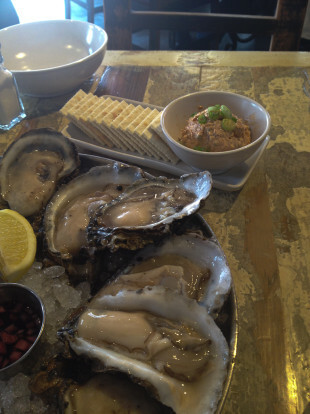 As good and quintessentially New Orleans as they are, you will not find any charbroiled oysters encrusted in cheese at Pêche, just fresh local specimens on the half shell with classic mignonette. Which isn’t to say that snacks like the smoked tuna dip served with Saltines are aggressively highbrow. 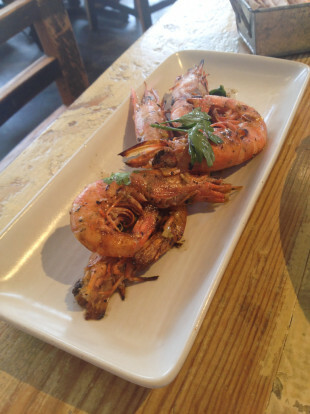 A plate of Royal Red shrimp showed up instead of the redfish with salsa verde I’d actually ordered, which has to be one of the few times that my fast-speaking mumble combined with Williamsburg-y service has paid off–because I ended up with both. The grilled Alabama gulf shrimp, buttery and naturally sweet, drew comparisons to Etxebarri’s shrimp in the Basque Country, which is kind of crazy, but not. The shrimp didn’t overshadow the originally intended dish, a grilled redfish covered nearly head-to-fin in a deep green forest of mint, parsley and garlic. 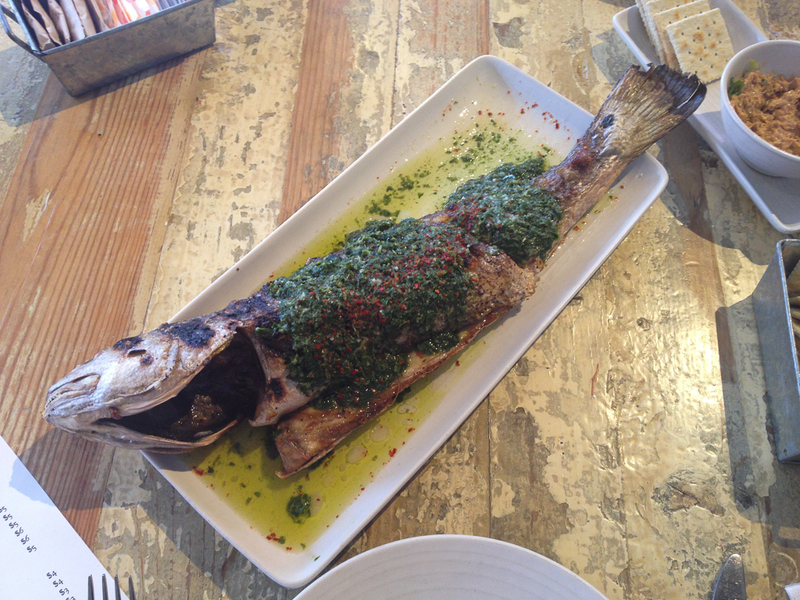 The whole fish on offer differs by the day, and probably makes the most sense for parties of three or more so you can also try some sides (which I forgot to order even though it didn’t really matter). The thing about New Orleans is that even though seafood is abundant and plenty of restaurants specialize in it, rich, breaded and fried styles rule most menus. Pêche’s reliance on its prominently featured wood-fired grill and focus on simply prepared, regional catches, can feel like a refreshing change. That said, make sure to get your fill of oyster po’ boys, shrimp etoufee, barbecue shrimp, and remoulade-dressed, pecan-crusted and crab-stuffed seafood too. 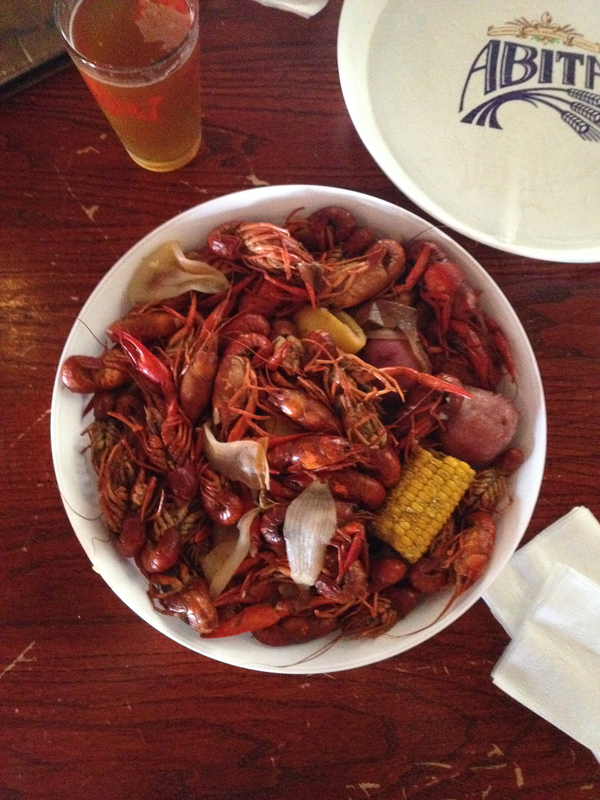 Despite this being my fourth visit to New Orleans, I’ve never been during crawfish season. Oddly, the Brooklyn crawfish boils began in earnest the same day I headed out of town. That’s ok. I doubt you get $15 for three pounds. I suppose the optimal experience is in someone’s backyard and it’s wonderful and social, but I don’t know anyone in New Orleans. Warehouse Grille happened to be doing a Sunday afternoon boil and was just a few blocks from my hotel. Crawfish is really more fun than filling (and the garlicky cayenne coating can overtake the what little meat you extract) so it’s an optimal meal if you want to do a “Bang-Bang” in Louis C.K. parlance. 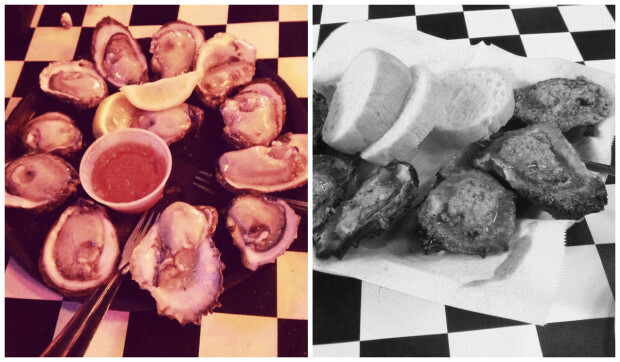 I’m not sure why oysters are so cheap in New Orleans–$13 a dozen even in the French Quarter–or if it’s that they are pricey in NYC (nothing can probably top the $8 oysters in Copenhagen, though). Acme is a classic and tourist fave that I’d never tried either, mostly because of the permanent line out front. So, both a dozen raw and half as many charbroiled, i.e. smothered in butter, garlic and Parmesan, before the crowds descended. Po boy banh mi mashups are totally logical and the closest I came to eating Vietnamese food. (I’ll probably catch flack but I didn’t get what the big deal with Vietnamese food in New Orleans is–I even rented a car and headed to Gretna and everything just seemed like what you’d find in NYC, i.e. pho, banh mi, bun, when I was hoping for something more unique like making use of local seafood or who knows what, or at least some concentrated cluster like Eden Center in northern Virginia.). 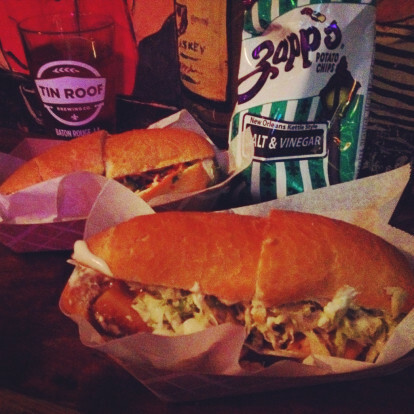 Killer Poboys was a pop up, now permanent, in the back of an Irish Bar, the Erin Rose. The end cap to a Bang-Bang-Bang, these sandwiches were pretty impressive. The coriander lime gulf shrimp po boy was exactly what I was looking for, incorporating fresh super-saline (not sure if this was a natural state or just salted) shrimp presented like an extra minty and fishy banh mi. The “dark and stormy” pork belly poboy was as hefty as the shrimp one was light. The fatty squares of pork were coated in a very gingery cane syrup and rum glaze, balanced with a limey slaw and made even richer with a layer of aioli. Traditional po boys can’t be ignored, of course. I consider Domilise’s, Liuzza’s by the Track and Parkway to be the big three. Maybe you agree? Domilise’s was closed on a normal business day with no explanation other than the hand-written sign on the door saying “closed today,” which felt appropriately New Orleans-y. Nearby Frankie & Johnny’s came through with shrimp po boys, thankfully, which served as breakfast. I never eat until noon on vacation, which is why I always try to cram in so much food in the evening. Po boys tend to be deceptively light for their looks, the bread crackly on top and almost airy inside, and the shrimp, despite being battered and fried, are greaseless and crisp. Oh, and there were debris, a.k.a. roast beef bits coated in drippings, nachos because it was Cinco de Mayo. I spied diners, who appeared to be locals, putting ketchup on both red beans and rice and po boys, which reminded me that Domilise’s adds ketchup in addition to the usual mayonnaise, tomato, pickle and lettuce that constitutes a “dressed” sandwich. Who am I to judge? Deanie’s was also closed (I wanted to try the original Bucktown location not the one in the French Quarter) so nearby New Orleans Food and Spirits, the name I can never remember because it’s so nondescript, sufficed. If you find yourself in the same predicament and don’t need a place to sit and eat, seafood market, Schaefer & Rusich, is also tucked into this suburban dining cluster where bright red carapaces litter the parking lots. More charbroiled oysters were had, as well as the gut-busting shrimp feast. Everyone seemed really into the breaded shrimp stuffed with crab meat–the neighboring table ordered an extra one–but I could barely eat one without dying so I brought it back to the hotel, stored it in the fridge and then ate it for dinner two nights later back in Brooklyn, which is kind of gross but I don’t care. 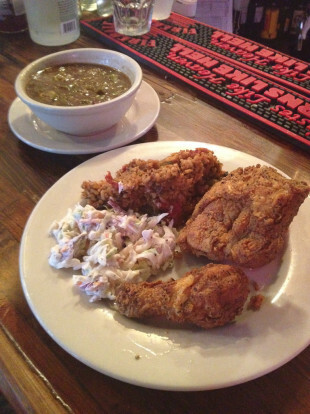 I always associate Coop’s Place with seafood gumbo, but the fried chicken isn’t bad, plus it comes with jambalaya. I also don’t recall Coop’s having lines out the door, despite never exactly being under the radar. One of the waitresses was complaining about people calling for reservations and asking if there was valet parking, so someone somewhere must have hyped it up. 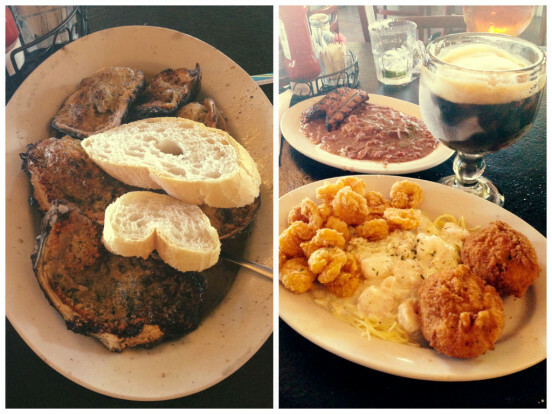 Maybe you’ve already done Cochon yet still want piles of pork and a Cajun influence? Get yourself to Toups’ Meatery. From the sweet-and-spicy pork belly cracklings amuse (so to speak) to the handsome slice of peanut butter, salted caramel and bacon Doberge cake, everything is sufficiently bold yet not excessive. The meatery board contains pretty much everything you could dream of, including a boudin ball, hog’s head cheese, chicken liver mousse and terrines. Bites of pickled pineapple paired with a crackling created the ultimate Hawaiian-Cajun mash-up snack. The bbq goat with a citrus slaw and gingery cornbread that was more like crusty cake also played with sweet and savory (my favorite), as did the root beer-glazed short ribs with heirloom carrots. You’ll also find many well-priced bottles wine (I was surprised at how many restaurants tipped the scales in favor of under-$45 selections) and cocktails like the Dr. Rouge (rye, ginger, amaro meletti). There was a restaurant called Palette in my hotel, though I’m sure they really meant palette since it was located in the so called Arts District. 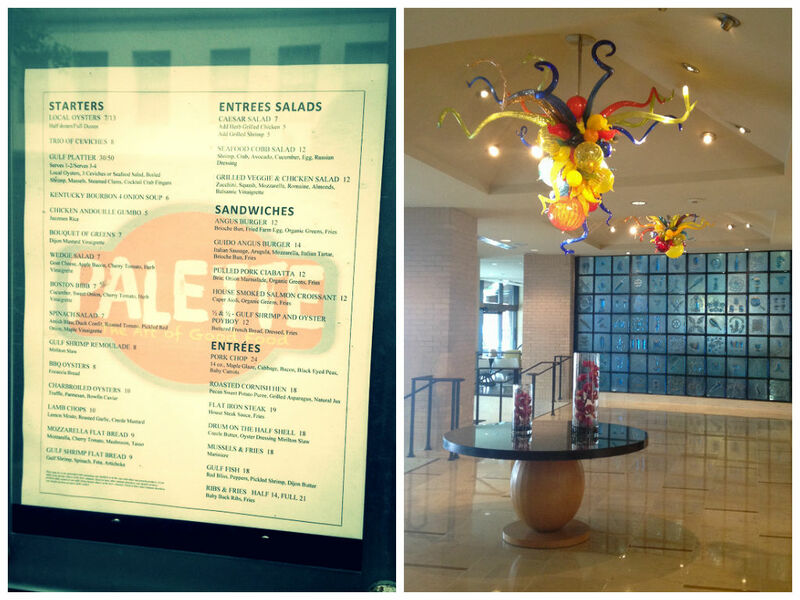 Plus, there was palatable-to-some Dale Chihuly art in the lobby. I imagine saying The Big Easy is akin to The Big Apple or Frisco or whatever horrible nickname locals would never use. I didn’t go wild with New Orleans photos considering I’ve probably taken shots of most of the classic foods (how many beignets, Sazeracs, and bowls of gumbo does one need to see?) during my four trips over the past decade (still thinking it’s weird that I ended up going the exact same week of February this year, as my first visit in 2002) and I rarely take photos of people or objects or myself anyway. But this is what I ended up with. Time is short in my world due to a combination of day-job-demands and general inertia, so I’m not likely to blog about any of my meals. I would probably talk about Dooky Chase and how it’s not fair to compare the fried chicken to Wille Mae’s on the next block, as I had intended because Willie Mae’s makes some of the best fried chicken in the country while Dooky Chase is more about the breadth of Creole cooking, as exemplified by the lunch buffet that I intended to bypass for a chicken-only-snack but got sucked into. And how I wasn’t feeling Herbsaint, but my urge for modern Southern/NOLA cuisine was more than satisfied by newish Sweet Olive in the lobby of The Saint hotel where the minimalist, lucited style bucks typical New Orleans frippery. Drum (the fish), pimento cheese, sweet potato, fried oysters, collard greens, grits, crawfish, chow chow, banana pudding, and red velvet all get elevated. Despite the plethora of sandwiches in NYC–these types of round-ups and columns make me cry–I rarely eat them out of some misguided carb-shunning measure that just gets bested by overeating multigrain crispbreads or corn tortillas instead. Both old-timer and newcomer favorites, Defonte's and Court Street Grocers are mere blocks from my apartment, yet I've never been to either. On vacations, though, sadness wanes and sandwiches are fair game. And in New Orleans you'd be crazy to pass up two classics: the muffaletta, a very specific sandwich, and po' boys, a genre that can include nearly any type of filling. Whereas a first-timer could easily skip Mother's for po' boys (though I would never disparage the choice–a Facebook friend posted a Mother's pic just days after I returned from New Orleans and I kept comments to myself) the same isn't true of Central Grocery. The much lauded mufaletta is worth experiencing–it is the original, after all. It's just that after trying it on our past three visits, it felt like time to branch out. Everyone else seems to do a warm version. In addition to its Pimm's Cup, Napoleon House is also known for its mufaletta (and I wouldn't stray beyond those two items). A whole one is good-sized and plenty for two to share, but not as massive as the original. Less oily and dense with a lighter, fluffy bread and enough melted provolone to create strings when pulling apart the quarters, this style draws less attention to the cold cuts. The chopped green olive condiment, cheese, and bread dominate. Cochon Butcher, who also presents its version heated, is all about the charcuterie–ham, salami, mortadella– as implied by the name of the establishment. Clearly, it's the more artisanal of the two. This style, too, uses a springier sesame-seed-studded bread than the original, which makes it easier to eat without totally blowing your appetite for the day. The Buckboard Bacon Melt, actually impressed me more with assertive and unexpected flavors. Essentially, it's a grilled cheese with Swiss, meaty bacon, a mess of tangy stewed collard greens for contrast, and spiced aioli for extra richness. I want to swap lettuce for greens on all of my sandwiches, now. Whether or not they were meant to be eaten with hot sauce, the house sweet potato, habanero blend added a sweet-hot kick that was irresistible. I ended up buying a bottle of the thick orange condiment to take home, as well as a bacon praline, which worked a little better as a spin on that candy than the Aunt Sally's version using Tabasco. I had no idea that the sweet potato was such as part of the region's identity. Over four days I saw the tuber's presence in a drink called the Casserole Cocktail (it tasted like Thanksgiving) at the Swizzle Stick, pickled in an amuse bouche at Sweet Olive, and mentioned in an ad for an upcoming beer dinner where one course was paired with Lazy Magnolia's Sweet Potato Cream Stout (I never found it in a bar, but their Southern Pecan Ale is very good). Ok, po' boys. They can really be crammed with anything like a hero/sub/hoagie. For me, the differentiator is that you can almost always get fried seafood, which I don't typically associate with sandwiches of this type in other regions. Of course, roast beef with gravy and "debris" a.k.a. bits of gravy-soaked-meat that have fallen off in the cooking process, is also very popular and has nothing to do with the sea. Mother's (my food diary, not blog, from the early '00s was far less verbose and photo-reliant–now I'm just being old and sentimental because my first and most recent visits to New Orleans were the exact same week ten years apart) and Domilise's have been done before, and now Parkway Tavern and Liuzza's By the Track can finally be added to my repertoire (these barely scratch the surface, but are probably the most popular four). Of the two excursions on this trip, my favorite po' boy was at Parkway (which they actually spell poor boy, which is the only sane way to pronounce it unless you genuinely don't enunciate R's at the ends of your words) but just by a hair. They do make their own bread, which is a soft baguette with a crackly top, soft enough to not cut up your mouth but with enough chew to give it character. I may have also been influenced by the double bloody mary. Stuffed with little breaded, fried shrimp and dressed with the requisite mayonnaise, tomato, pickles and shredded lettuce, this was a near perfect rendition, a blend of hot and cold, both pillowy and firm. Instead of ordering the surf and turf, which is roast beef and fried shrimp, we ordered both components as separate po' boys. I'm biased against insanely messy sandwiches, so the roast beef oozing with gravy wasn't my friend, and I can't imagine what a beast the surf and turf would be to wrangle. Since we were swapping halves (these are larges, by the way, not regulars) and I started with my favorite, by the time I got to this sandwich the bread was a disintegrated mess and the top slice wouldn't stay in synch with the bottom, each bite sliding the two farther apart. James, however, preferred this over the shrimp, so it's just a matter of taste. He also insisted on taking the photo and it kept blurring and we got into a tiff–roast beef po' boys cause problems, that's all I'm saying. It's always about personal biases, though. The only reason why Liuzza's By the Track (not the same as Liuzza's that's not by the racetrack and is more of a sit-down restaurant that stays open past 7pm) was minutely less winsome to me was because the mayo was applied with a heavy hand and instead of melding into a soup with the vegetables, it remained thick and blobby, a psychological culinary barrier. 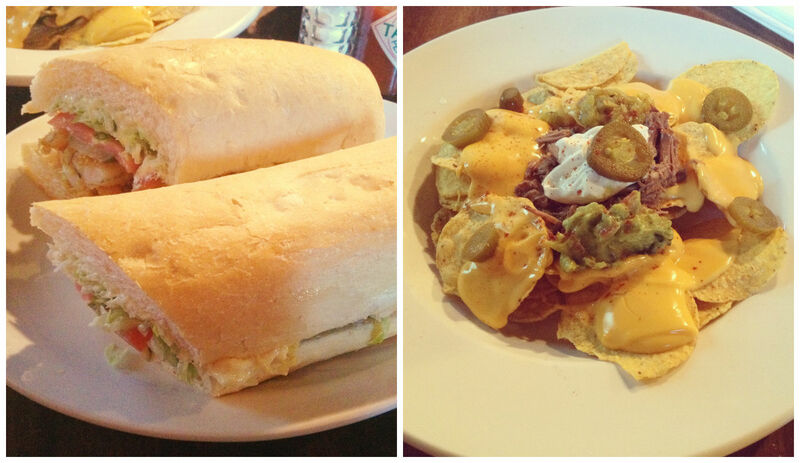 With that said, this was a very good po' boy. As was the rendition with fried, garlicky oysters (kind of like that other New Orleans specialty, charbroiled oysters, in sandwich form) that wasn't photographed. I didn't notice the soft-shell crab special on the wall until after I'd ordered–I would've loved to try that one. And I must also add that the thin-style gumbo filled with andouille, shrimp, and chicken was my favorite iteration of the iconic dish that's done in so many ways that I'm not even going to attempt rating or discussing it. This cup was light (or maybe didn't use it at all) on the file powder, the ground sassafras leaves that thicken and give everything that quintessential New Orleans smell and flavor that's akin to spiced dirt, the very essence of earthiness. Cajun or Creole, I'm not sure, but a little goes a long way. There’s no escaping pork no matter where you travel in the US. 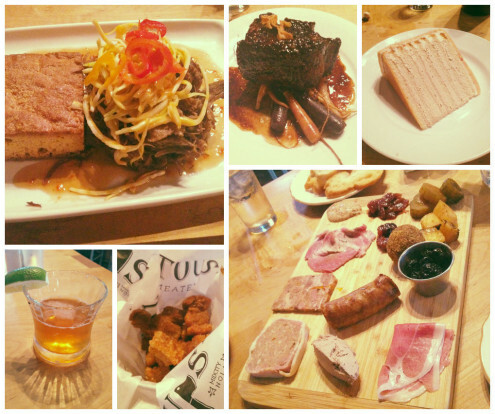 Cochon is The Publican of New Orleans, right down to the prominent pig paintings. Or maybe The Publican is the Cochon of Chicago. Cochon Is two-and-a-half years older. I’m currently planning a Labor Day trip to San Francisco and Incanto is high on my list—are they cut from the same porcine cloth too? Bah, I’m still waiting for goat to go mainstream. While scanning the menu and having a hard time deciding what I wanted as a main (I still think it’s odd that we were never told the specials and didn’t realize there were any until I started seeing a mysterious fish dish topped with an egg on tables appear on tables near us) since James claimed the namesake cochon, I also began wondering if the number of fedoras in the city shrinks drastically after Tales of the Cocktail is over. I also wondered if young men realize you’re not supposed to wear hats indoors—thank god the Wall Street Journal has taken up my cause. The food is so rich and distinctly flavored that you could just order a bunch of the smaller dishes, share and be sated. My favorite might have been the paneed pork cheeks. They were so unique because if you hadn’t read the menu—or temporarily forgot like I did—you’d think you were eating al dente beans, curiously textured and pleasantly mealy. The little nubs were softened peanuts like you’d get boiled in the shell in the south. Add sharp radishes and unctous pork cheeks, and you have a combination not likely found elsewhere. The mushroom salad also went down the unexpected pairing route by incorporating fried beef jerky, hints of cooling mint and thin wagon wheels of preserved lemons. Now that’s a way to serve vegetables. Fried rabbit livers on toast got a lift from a savory, not terribly spicy pepper jelly. Not feeling like embarking on one of the larger entrees, I ordered a bacon and fried oyster sandwich (not pictured) then regretted my choice after seeing the bowl of suckling pig, wintry cabbage and turnips (I actually like root cellar vegetables more than fresh warm weather ones) garnished with curled cracklings. Thankfully, it was too much meat for one person in one sitting and I was able to try a good portion of this delicacy. While sweltering for close to 30 minutes on the corner of Tchoupitoulas and Poydras, waiting for the phantom bus 10 to whisk me to my po’ boy destination, I had two inclinations: one, to faint (not from hunger—the problem with vacation eating is that I can never conjure up enough appetites to cover all the meals I have in mind); two, to give up and get in the line at Mother’s, the tourist fave we were standing in front of. I’d already had po’ boys at Mother’s on my previous two (pre-digital photography) New Orleans visits, though. That would be pathetic. I haven’t eaten enough po’ boys in my life to have stringent standards. I would hope to recognize if I were eating a bad version. These were not that. Roast beef is popular, but to me that isn’t much different from a hoagie, sub or your sandwich parlance of choice. What I don’t often encounter in the NYC area are fried seafood sandwiches. These I associate with New Orleans. Of course, there was that little matter of the Gulf oil spill. I did not anticipate shellfish being on menus they way it was. Either the local seafood wasn’t affected or they’re not using local product. I hate to say it’s probably the latter and may have always been the case (you can never assume that the food you’re eating–even in places known for their cuisine–came from the immediate area). I did not ask. I can enjoy my fried, breaded nuggets without getting all locavore about it. Yes, Domilise’s derives much of its charm from its frozen-in-time digs. You order at the counter where the women in the family seem to man the cooking station, and order drinks at the bar where a spry, older gentleman hands you beverages amidst faded ads for Jax beer and Manning brother memorabilia. More than a few businesses in New Orleans were using mechanical cash registers. A dressed shrimp po’ boy full of shrimp nuggets. I’d read complaints that they skimp on shrimp, but this isn’t paltry to me. Dressed at Domlise’s means lettuce, tomato, pickle, mustard, lots of mayonnaise…and ketchup. I don’t recall ketchup on others I’ve eaten. Very American flavors. Yep, it’s a sloppy mess, though the sludge layers well with the warm, crispy shrimp and crackly crusted, fluffy bread. The oyster version happens to looks a little more dressed at this angle, but in all, not much different in appearance from the shrimp. Meatier, moister and flatter than than the shrimp, the oysters meld a bit more with the sandwich. This is a small. Large is four slabs. 1/2 I was recently talking with a trade mag writer and got on the topic of pizza, burger and fried chicken mania. He didn’t get it and was of a burger is a burger why overanalyze it mentality. I tend to agree (says she who photographs 85% of her restaurant meals). I just can’t get into the nuances of a pizza slice, and frankly, don’t have strong opinions on these American classics. I’m forgiving on the mediocre end—I can’t think of a particularly bad burger that I’ve eaten. But on the rare occasion that I encounter an exemplary version of a foodstuff, I certainly recognize it. Willie Mae’s Scotch House, the no-secret-to-anyone restaurant just a handful of streetcar stops from The French Quarter, squeezes in the crowds during their narrow four-hours-a-day operating window. And it’s not just touristy hype. I ate a lot of fried chicken over our long New Orleans weekend: fast food-style at Popeye’s and even lower brow at Brother’s, a 24-hour convenience store near our hotel. It was all pretty good. But nothing matched the pure golden perfection of this three-piece plate. The crust is substantial, but not superfluous or heavy despite its strong presence. I don’t know if it’s the seasoning (neither too salty or peppery) or the cast-iron pan frying that makes the skin and batter meld into a single, flaky entity. Greaseless is often an adjective used to describe stellar fried chicken. These drumsticks and breasts were oily, grease was present (James wrapped up my third uneaten piece in napkins and stuck it in his bag and it soaked right through its paper wrapping) and there was nothing wrong with that. The meat stayed juicy. Normally, I’m ho hum on chicken breasts but the one I saved to eat in the middle of the night was still moist and the skin hadn’t turned blah and flabby. Soupy butter beans are a classic side. I regret not ordering a biscuit, too. So, now I have a benchmark and I’m spoiled. I’ve yet to eat any fried chicken in NYC that matches Wille Mae’s. Ok, that’s not saying much since I actively avoid crowds and long waits, particularly in one corner of Brooklyn. I will build up my tolerance and see if Pies ‘n’ Thighs and The Commodore deliver the sublime experience everyone says they do. Bold turquoise with turrets, white trim and jaunty stripes like a birthday cake of wood and shingles, as popular with men in bowties as with visitors flaunting the jackets preferred rule (purposely or not, I'm not sure), Commander's Palace is exactly the type of Tavern on the Green restaurant I avoided on my previous two visits to New Orleans. Now older and more nuanced, I can respect frippery. My last trip in 2004 I stayed at loft 523; this time, Le Pavillon, where I'm still marveling over a fireplace being employed in sweat-drenching July to evoke grandness, air conditioning bills be damned. And the food wasn’t bad. It’s way over the top, though. When people ask, “What was the food like in New Orleans?” I think of this appetizer. The brunch includes a starter, entrée and dessert. I only ate this last weekend and I’ve forgotten the exact components because the fat clouded my brain (or maybe all those sazeracs caught up with me). It was all a bloody mary-fueled blur of creamy, starchy foundations, eggs and multiple sauces crowned by fried bits. What I distinctly remember is that the hollandaise is made with bacon fat! Take that. And I did (which is why I’m trying to eat light and fresh as possible during August—I need to lay low nutritionally so I can overindulge again while in San Francisco over Labor Day). There is also cheesy garlic bread served with more butter. That would’ve been plenty, but the main dish was still to come. Shrimp and goat cheese grits. What I wasn’t expecting were the mild hoisin and ginger flavors. Eggs cochon de lait—a signature brunch dish—hits all the decadent notes, and hard: suckling pig “debris,” gravy, flaky biscuits, poached eggs and…bourbon-bacon fat hollandaise. I couldn’t even try one bite of this because my shrimp and grits had knocked me into a savory stupor. I rarely order dessert anymore. Declining isn’t an option at Commander’s Palace, though. If I am going to do a sweet course, New Orleans is the place to do it because they showcase my favorite flavors. I’ll always choose nutty and caramelly over chocolatey or fruity. Ok, there was chocolate in this pecan pie, but it was all about the buttery goo and the fleur de sel caramel sauce added just enough dimension to keep me from dutifully eating one bite and calling it a day. The balloons in the garden room (definitely worth requesting for the tree house effect) weren’t for a party. It’s always a party at Commander’s Palace. The roving jazz trio played “Happy Birthday” twice, and I didn’t have the heart to make them play it a third when they asked if I had any requests. I’m afraid that I came across New York brusque when I said no, but it was more a matter of having no idea what would be appropriate to ask for. After they broke into “Blue Skies” I had a better idea of their repertoire. I do think they sell pralines here, but it's really more of a restaurant. Praline Connection from the deep recesses of my back up to do list. primarily for me since James wasn't keen on eating battered organ meat. For some reason we ended up on Magazine St. more than any other road in the city, and yet I almost missed this little place. That would've been a shame. In a touristy fit, I decided I needed pralines but was put off by all the overpriced pecan confections on Decatur St. James surprised me by remembering a big bright store-side mural touting pralines that we'd passed the night before. Right, it was Tee-Eva's. Pralines are in their name, but I was afraid it was no more than a snowball (snow cones minus the cone) stand. And I wasn't sure it was even open, so I kept surveillance in the comfort of our air-conditioned rental car. The small brightly painted structure only has a take out window, and while scoping it out, customers paused for icy treats, not brown sugary disks. As it turned out, they not only had pralines, but mini pies (pecan being my all-time favorite) and daily savory specials like catfish and macaroni and cheese, too. Everything was homemade and freshly baked and crafted. And their snowballs werent bad either.